Illinois State fans at the Redbird Reception on Friday, January 9, 2015, in Richardson, Texas. The Redbirds are playing for the FCS national championship, and fans from all over the country traveled to Frisco, Texas, to cheer on Illinois State. Hundreds of Illinois State fans gathered inside the Renaissance Dallas Richardson hotel on Friday night for a Redbird Reception, featuring the Big Red Marching Machine, ISU cheerleaders, and an appearance by a cowboy hat-wearing President Larry Dietz. STATEside spent all day Friday talking to Redbird fans. Here are some of the highlights. While most fans had to travel by car or plane to Texas, a loyal group of Illinois State fans were already here. The Dallas Alumni Network is a tight-knit bunch of Redbirds who gather 12 to 15 times a year for Athletics watch parties, Avanti’s Gondola parties, and other events. They’re led by Susan Nelson-Brown ’78. The College of Business grad was on hand Friday for the Redbird Reception, along with “dozens and dozens” of other Dallas-Fort Worth metro area alums. With the FCS championship game played in nearby Frisco every year, Nelson-Brown said she was confident she’d be seeing a Redbird game in person soon. “We’ll have a big turnout within our alumni group at the game,” she said. FCS championship gear for sale in Texas. 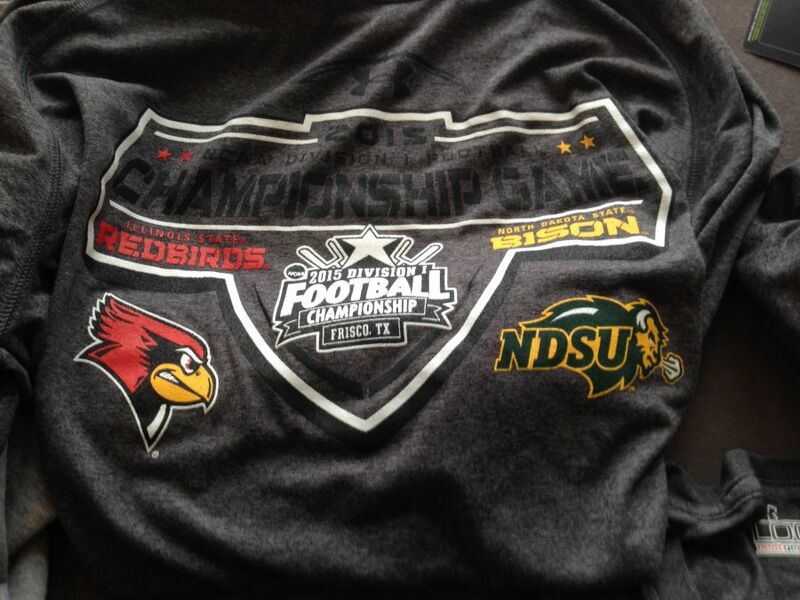 As expected, official gear commemorating Illinois State’s appearance in the 2015 FCS championship game has been a hot commodity. Caps, sweatshirts, and collectible pins sold out within a few hours at the NCAA’s on-site location at the Redbird team hotel Friday, and only a handful of T-shirts remained. Tees have been tough to keep in stock in Bloomington-Normal too, with ProImage in Eastland Mall and Alamo II both reporting brisk sales. More items will be available at Toyota Stadium when the gates open Saturday morning. Should the Redbirds emerge victorious, fans won’t have to wait long for merchandise commemorating the national championship. Items should be available on GoRedbirds.com and ShopNCAASports.com shortly after the game, and Bloomington-Normal retailers Alamo II, Barnes and Noble University Bookstore and ProImage—among others—should be well stocked within days. Hundreds of Illinois State students are expected to be in the stands Saturday at Toyota Stadium. Among them will be die-hard fan Michael Ruiz, a former Red Alert student leader. The senior middle level education major (focus in math and science) was at Friday’s Redbird Reception with other students and young alumni. This season has been full of big moments, thanks to stars like Tre Roberson and Marshaun Coprich. Ruiz had a feeling that Frisco was possible, after seeing the Redbirds win on the road and put together long winning streaks. Former Redbird Cody White with coach Brock Spack at practice Friday, January 9, 2015, in Frisco. 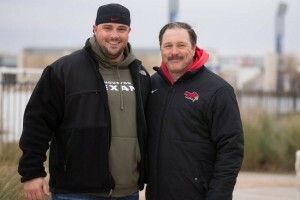 Former Redbird offensive lineman Cody White, who plays for the NFL’s Houston Texans, is in Frisco to help cheer on his former program. White made the four-hour trip from Houston and watched the Redbirds practice on Friday. White last played for the Redbirds in 2011, signing with the Texans in 2012. He tore his Achilles tendon during training camp last season but expects to be back on the field and ready this spring. White says he followed the Redbirds throughout the regular season, despite his busy schedule. See the full list of Redbirds in the pros. The Redbird softball team on their bus headed to Frisco. The Redbird football team is getting some big support from other student-athletes at Illinois State. 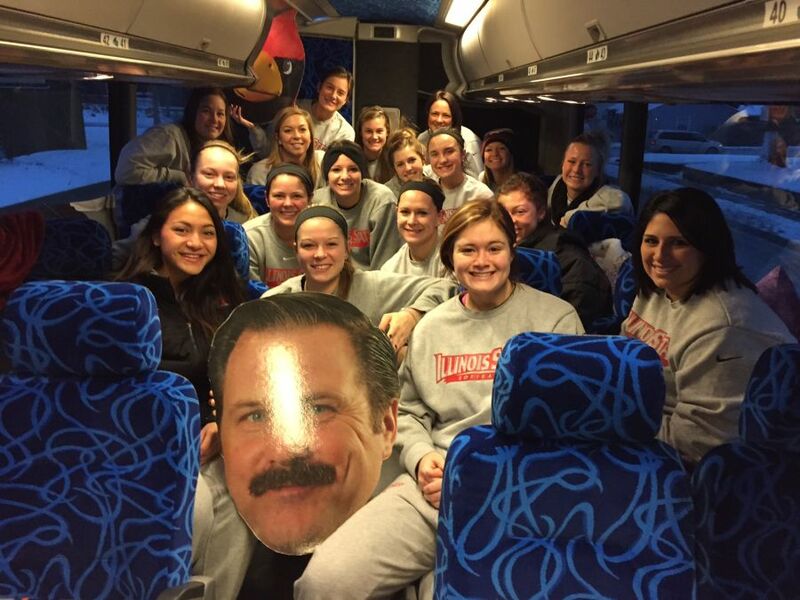 The softball team made the trip to Frisco, taking a bus ride with some special stops along the way. After stopping Thursday at a hitting facility in Springfield, Missouri, head coach Melinda Fischer ’72, M.S. ’75, surprised the team by taking them to the ASA Hall of Fame Complex in Oklahoma City. Players were able to walk on the field where the NCAA Women’s College World Series (WCWS) is played—an inspiring moment. Players also enjoyed seeing their volunteer coach, Bill Dickson ’54, M.S.E. ’57, among the Amateur Softball Association of America Hall of Fame inductees. “Seeing Bill in there was an amazing reminder of what he has done for our program and our sport,” Fischer said. The team then stopped Friday at the University of North Texas for a rare January outdoor practice. The Redbirds were set to cheer on their football peers Saturday in Frisco. “Our athletes support each other really well,” Fischer said. Watching the football team reach the national title game has been inspiring for the softball team, said catcher Stephanie Gallant, senior team captain. The Frisco bus trip is also great team-bonding time, she said. “We look at each other and it’s like, ‘We could do that. This could be our year,’” said Gallant. Illinois State’s first appearance in the FCS championship game has kept local news media busy providing information-hungry Redbird fans with fresh material. Randy Reinhardt is the Redbird beat writer for the Bloomington Pantagraph. He says he sketched out a coverage plan immediately after Illinois State’s win over New Hampshire in the national semifinals and was a little concerned his editors would think it overkill, but he says the paper has embraced the extra coverage. He’s been filing 3-4 Illinois State stories per day leading up to the game, and says the feedback has been tremendous. “It’s clear how much this has meant to the community,” Reinhardt says. “People are really loving it.” The paper has also dispatched sports editor Randy Kindred to the game. Radio Bloomington stations WJBC, WBNQ, and B104 have four different show hosts on hand. Country station B104 has originated its morning show, Top 40 WBNQ has done its afternoon show, and news/talk WJBC has done both drive-time programs live from Texas since Thursday. The stations have combined for nearly 40 hours of live programming from the Redbird team hotel leading up to the game—and that doesn’t include WJBC’s three-man crew calling the play-by-play Saturday. Lee Hall ’85 of WEEK/WHOI has spent the last several days shooting, editing, and interviewing and has been sending a steady stream of feature stories back to the stations for use during the nightly news. Illinois State’s student media is here in force, too. TV-10 sent a crew of three students, while the Vidette and WZND radio each sent a pair.